Please note, this tool is currently in development. We have tested it on most modern web browsers, however some functionality may not work on your computer. If anything does not work as expected, please reload the page (F5) and try again. Please send your comments to enquiries@sticker-zone.co.uk. Select an image from your computer. JPG, PNG and GIF formats are allowed. Max file size is 5MB. Uploading a saved StickerZone™ design file will completely clear the current design and restore the saved design. Any existing images or text will be lost! Our Sticker Designer online design tool allows you to easily create customised artwork for your stickers, without the need for computer graphics skills or special software. The preview area starts with a blank template. You can now start to create your design using the Design Options panel. Change the background colour if you wish, or add images and text to your design. You can choose backgrounds and images from our library, or upload image files from your computer. As you add text and images, they will appear on the preview area. You can see a PDF preview of your design at any time. This will show how it will appear when printed (please note, the copyright watermark will not appear on the finished sticker). Due to unavoidable differences between browsers and computer systems, the PDF may appear very slightly different to the Layout Area view. Simply go back and adjust your design until you are happy with the PDF preview. Make sure you are completely satisfied with the PDF preview before sending your design to StickerZone™. Your design can be saved at any time, as a StickerZone™ Project file. This can be used to reload your design at a later date and carry on exactly where you left off. Thank you for using StickerZone™! Please Note: StickerZone™ reserves the right not to print any design which is unlawful, harmful, threatening, abusive, harassing, defamatory, vulgar, obscene, libelous, or otherwise objectionable. Please see our Terms and Conditions of use. Use of this website signifies agreement with the following terms and conditions of use. 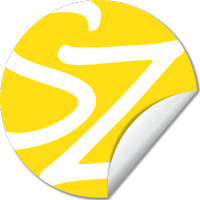 This website is only to be used for the purposes of designing stickers to be submitted for printing by StickerZone™. otherwise inappropriate, offensive or objectionable. You must not use this site in a manner that adversely affects the availability of its resources to other users. You must not use this site in a manner that avocates, promotes or assists any illegal activity or unlawful act such as intellectual property infringement or computer misuse. You undertake not to upload to this website any viruses, Trojan horses, worms, time-bombs, keystroke loggers, spyware, adware or any other harmful programs or similar computer code designed to adversely affect the operation of any computer software or hardware. You undertake not to upload to this website any material which infringes any intellectual property right or other right of any other person. Designs created by this website are not to be used to impersonate any person, or to misrepresent your identity or affiliation with any person. NOTE - please make sure you have previewed your design, as this is how it will appear when printed.